Arras, capital of the Artois region of northern France, is best known for its spectacular Grand’ Place and the smaller but equally beautiful place des Heros. One of the prettiest towns in northern France, its set pieces were built in Flemish Renaissance style. Tall red brick or stone houses surround the Grand’ Place on four sides, with rounded gables at the top and a series of arcades at shop level. The squares look the part, but in fact, the town was restored almost entirely after the ravages of World War I had destroyed the old heart. An important city, it was one of the major trading posts of northern France. From Paris Nord, fast TGV trains leave at regular intervals and take 49 minutes to reach Arras. Fares start at 21 euros. Arras station, place du Marechal Foch, is a ten-minute walk up rue Gambetta then rue Desire Delansorne to the Hotel de Ville. From the UK Take the Eurostar to Gare Lille Europe. Then change platforms for regular TGV trains to Arras, taking 30 minutes. Ferry information from Dover to Calais. There’s a good choice of accommodation in Arras, both modern and historic. Housed in a former Jesuit monastery around a cobbled courtyard, rooms are comfortable and you’re only ten minutes walk away from the town center. It’s the smartest hotel in town, and offers cooking classes with its chef. Read guest reviews, compare prices and book the Najeti Hotel de l'Univers on TripAdvisor. Right in the heart of Arras, this small, two-star 12-roomed hotel has been recently refurbished. It’s friendly and welcoming, but be warned there is no lift. Read guest reviews, compare prices and book the Hotel Diamont on TripAdvisor. Centrally located by the railway station, this business hotel is comfortable, with good bathrooms and some spacious rooms. In a red brick cellar but with a shady outdoor terrace for summer dining, this is one of the best restaurants in Arras. Their excellent value 29 euro menu starts with oysters or foie gras, moves onto the likes of andouillette for the adventurous, magret duck or cod, and finishes with goat cheese or a mango and lychee crumble. Art Deco interior complete with stained glass, is a change from the other brasseries and red brick cellars in town. Long menu with specialities like plateau de fruits de mer. With a restaurant and a brasserie/bar, this busy restaurant, attached to the Hotel Astoria-Carnot and near the station, caters to all types. Good regional menu and brasserie staples. Walk down steps to a warm, welcoming cellar for Land and Sea dishes (you get the clue with the name) such as roast duck with pears in wine or salmon with ginger and pineapple. Atmosphere is convivial and the cooking good. Arras has a wide variety of attractions, from the Grand’Place to the superb World War I Wellington Quarry Museum. 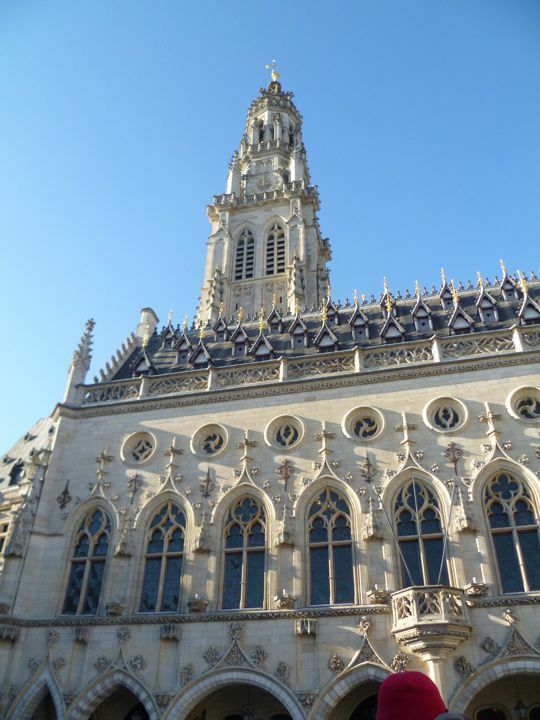 With a history that stretches back over the centuries, Arras is an intersting place. After the Grand’ Place, make your way to the Town Hall in the pretty place des Heros. Apart from the well-equipped tourist office, there’s an interesting exhibition of photographs of Arras during World War I. It's worth the slight scramble to get to the top of the belfry, via a staircase and a lift, for a view over the town. Below ground, you can go down into the earth and the town hall boves (tiers of cellars once used as warehouses). Arras was like a piece of cheese, full of holes and you’ll see some of the earliest cellars here, dating back to the 10th century. The 18th-century Abbaye de Saint-Vaast is a huge classical style building, housing the Fine Arts Museum, 22 rue Paul-Doumer. It’s currently rather a splendid decaying building, though there are great plans for it to be redeveloped as part of a huge new cultural project. In the meantime, enjoy the treasures here: a huge collection of 17th-century paintings; a Rubens and a tapestry made in Arras at a time when the town was a leading tapestry maker. The Vauban Citadel,just to the western edge of the town was made a UNESCO World Heritage Site in 2008. A defensive system designed to protect the towns of Louis XIV and built between 1667 and 1672, it's interesting for the site. Don't miss the British Memorial, the World War I British Cemetery which has the names of 35,942 soldiers missing after the battles of Artois engraved on the walls. Arras was a vital part of the Western Front, at the center of the fierce fighting over the coal fields nearby. Go by car, or take a taxi and make your way to Vimy Ridge, and the war cemeteries of the French at Notre-Dame de Lorette, the British and Commonwealth soldiers at Cabaret-Rouge and the German cemetery at Neuville-Saint-Vaast.